Released: 1992. Genre: Horizontal-scrolling shoot 'em up. Other versions: AMI; CPC; AST; C64; SPC. An adaptation of the popular Manga comic series Area 88, U.N. Squadron tasks a mercenary group to bring down the terrorist forces of Project 4. Using a variety of aircraft with somewhat dubious weaponry, 13 gruelling stages await you to prove your worth. 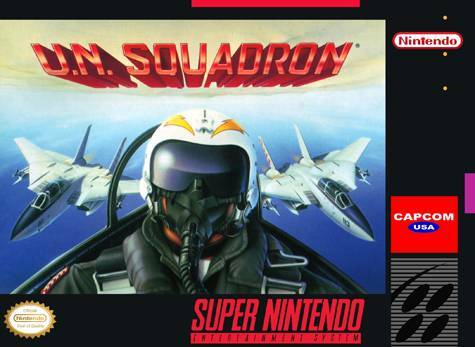 A side scrolling shooter of a best possible ilk, the original 1989 arcade presented limitations for the player, something of which the Super Nintendo removed and put in far more options and methods of achieving your goals. With character and aircraft selection available, plus an extensive range of weapon upgrades, the main premise of destroying everything becomes entwined with your pre-mission decisions. 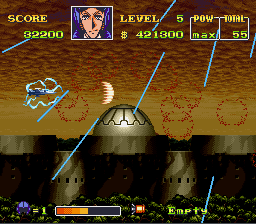 A facet that many other shoot ‘em ups included thereafter. Armed with your flying war machinery, the private army of the squadron will not give in, and it’s up to you to blast through the hoards of enemies and imposing, impossible bosses to win the day. Take to the skies and don’t be hesitant. If you do, defeat is a certainty. A dramatic opening cut-scene really sets the tone for this dog fighting jaunt, as does the rousing intro theme. Following on several years from the original, it’s obvious that Capcom made improvements for the SNES; a real effort has been made to showcase a tough anime shooter both in playability and presentation prowess. As with the coin-op, things kick off with a character select, but in this case the aircraft they pilot are not set in stone with six different kites to get the job done. Individual character traits are kept in place, which separates them to the skill level of the player. 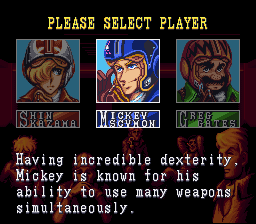 Greg recovers quickly from damage therefore being the beginner’s choice, whereas Mickey specialises in multiple weapon use making him one for the experts. Shin, the most recognised of the three from the comic books is the all-rounder, and is the most popular choice. These pre-mission selections change the experience of the game in both campaign strategy and difficulty, adding life to what could have been a rather short, mundane outing. Further in-game options extend this even more. Blood money is earned during each mission, building an account that enables you to buy additional aircraft and firepower. A myriad of extra outlandish weaponry is also now available over the original, some of which are vitally important to beat particular enemies. Some specialist weapons are required for just one point in the game, or some are simple eye-candy and provide no real advantage, but discovering this is part of the entertainment. Finally and most importantly is the inclusion of the mission select screen. Previous versions of the game had you set on a linear path of missions, but here you have the chance to pick and choose your battles. This alters the flow and feel of the game, making it a more personal experience, weather it be for tactical or budgeting reasons. It’s great to see this in a shoot ‘em up, as it makes it far more interesting, and I haven’t even got to the real highlights yet. Gamers have often complained about games of this type to be far too difficult and unforgiving, putting the player off after only a few failed attempts. 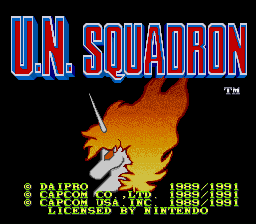 U.N. Squadron pulls off the same balancing act parlour trick R-Type does; presenting you with a very tough challenge, but dragging you back kicking and screaming for more. This is due to the steady learning curve, an energy bar preventing no instant deaths and choice of how to progress. If you find a level is being a hard nut to crack, there will be an alternative for you to continue, home your skills and return with more power, weapons and knowledge. Also, the control system is extremely user friendly. While intimidating at first, you will soon be shooting, moving, deploying and selecting the different weapons simultaneously in the heat of combat with relative ease. As the levels play themselves out in a set pattern, learning this is the key to success, but this also detracts an element of surprise from the game. Sure, it will take a long while to memorise it all, but it is possible to almost blindly pass the early stages after practice. The latter stages show more adaptation in the enemy movements, particularly the bosses, which provide the most difficult parts of the game. Collision detection is predictably merciless but precise, with the slightest false move proving deadly, and some enemies come at you in places where you cannot reach. Saying this, the pace of the game is excellent, giving you short recovery stints for the next ruthless wave of baddies to come at you. Thankfully, slow-down is not common but does occur when the screen is very heavy with sprites and with a special weapon deployed. When this does happen, it’s almost undetectable and doesn’t affect the gameplay hugely unlike Super R-Type, which suffers badly due to the SNES’s limited processor speed. Often overlooked, the soundtrack to U.N. Squadron is outstanding. The variety of instruments used is set in such a way that all the music fits together as if taken from a hit album, each track being individual but at the same time having a memorable and affirming sound. Tracks vary from high-octane speedy riffs or more serene tunes, matching to the level they grace. The heat-driven desert level for instance contrasts with the foreboding submarine music. The only slight complaint I have is with the SFX, as while fine in all departments, they can encroach on other sounds or become muted momentarily, which does distract on occasion. This is most noticeable with the Vulcan cannon/Megacrush combination. Graphics are near flawless; with distinguishable sprites, a perfect anime colour pallet, beautiful backdrops and scrolling and smart Mode 7 cut-scenes. Bosses are heavily detailed too, and at no point does the appearance seem rushed or lacklustre. The heat-haze effect on the desert stage for example is wonderful. The blend of anime and all-out blasting is not uncommon, but can be messed up if done incorrectly or unbalanced. U.N. Squadron sets a perfect platform of how to get this bang on the money. Improving and the arcade original immensely, this is certain Top 10 in the shooter charts for the Super Nintendo, and genre which it has been known to struggle with. With near perfect visuals and sound, vehicle set up functions and a freedom of stage select, this is a high quality effort from Capcom. It’s a shame they don’t make them all like this.